My world was upside down. After 36 long hours of labor, I finally delivered our first baby who died half-way to term. I left the hospital with post-partum hormones raging, milk flowing, and enough grief to sink a ship. Wiping away streaming tears and snot, I couldn’t help it. God got an earful. Why God?! We prayed for this baby! We loved our baby! The truth is, the more you love the more you hurt. The greater the bond, the greater the pain. It’s part of being human. I like the fact that Jesus “gets real” about suffering. He doesn’t sugar coat the truth. He validates our pain, and shares secrets to finding joy in the midst of it. It was an honest question. They were trying to make sense out of it, like we do. Sudden loss. Chronic illness. Unfixable problems. Broken relationships. Issues that leave us with more questions than answers. The man was born blind. It’s the last thing a parent wants. We prefer a 10 on the Apgar scale. Like you, these guys wanted rock-solid answers. Do you see the shift that Jesus prompts? His friends were thinking cause and effect. They were looking for something to blame and asking the wrong questions. Jesus wants them to switch their focus to look for what God can do. Then He spits in the dirt, slathers mud on the man’s eyes, and tells him to wash in a nearby pool. The man comes back sporting 20-20 vision dancing a jig peppered with cartwheels and back flips. OK. My imagination took over. Wouldn’t you love to have seen it first hand? God has given us the gift of choice. We get to choose what we look for. If we look for milk in the refrigerator, we find it. If we look for poop, we find it, too. The truth is. . . Awhile back, another whisper came, seven years after our sixteen-year-old son relocated to Heaven. Emerging from a long hard trek through the dark Valley of Shadows, I heard my Father’s voice again . . . Pave the way. Show them HOW to embrace their loss, and I will heal their heart. One million expectant mothers suffer a pregnancy loss every year in America. Up to 59% of grieving parents get stuck in unresolved prolonged grief. [ii] That must stop. 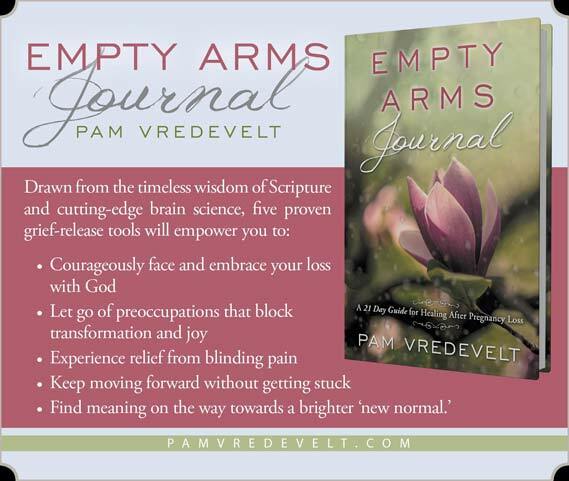 I’m excited to tell you that the Empty Arms Journal: A 21-Day Guide for Healing After Pregnancy Loss is now available. It’s the first of several guided healing journals. Please get a copy and share a lifeline. In the meantime, when things don’t turn out like you hope, keep your eyes of faith open. Look for what God can do. According to Jesus, it’s a secret to finding joy. Müller recounts how he prayed when he discovered his wife had rheumatic fever: “Yes, my Father, the times of my darling wife are in Thy hands. Thou wilt do the very best thing for her, and for me, whether life or death." For most of us, the list of people we’re longing for reunion with is lengthy. But those who have lost a child, either before or after birth, have one more compelling reason to long for Heaven. A friend who recently experienced a miscarriage shared this powerful blog post with me.